1. 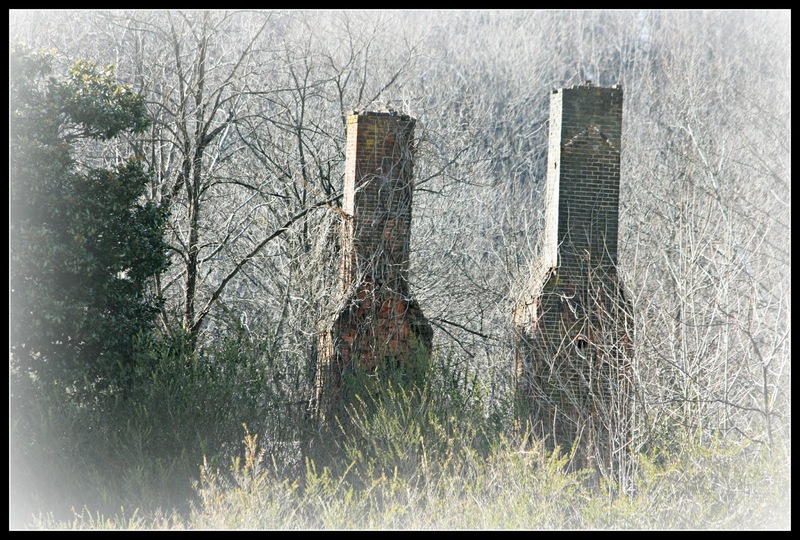 Someone, somewhere, must remember the home with dual chimneys that once stood here, in Waid Park. 2. 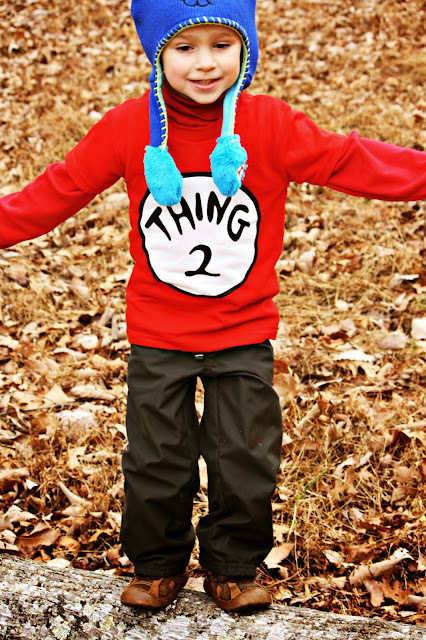 Recently at dinner, I asked Cort what he wanted to be when he grew up. He thought about it for a moment, while I waited, curious. He looked at me very seriously, and said, "A grown up". I told him that was an excellent goal. 3. The boys and I were talking about making cookies, and we were trying to decide what kind to make. Reid said, "We should make dog cookies. But that don't taste like dog". 4. I read a lot of books this month. Fourteen books in all (and one was almost 800 pages)! I guess January is a good month for reading, if nothing else. 5. The twins have started drawing scenes all the time, and then they tell me stories about what is happening in the picture. I love seeing how their imaginations are working. I was looking for a recipe in my great-grandmother's collection recently, and came across this card entitled "Memorable Summer Meals". It is from 1973. 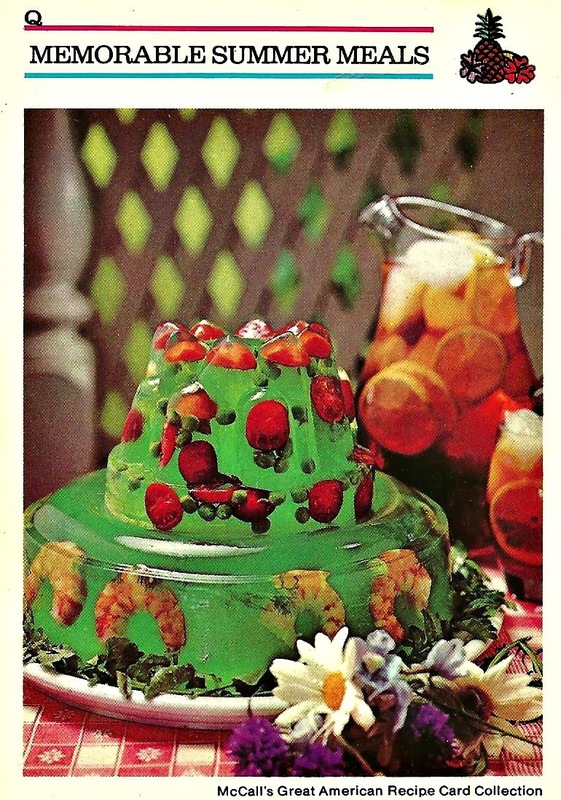 I don't know what you think, but I can say with certainty that if someone served up a summer meal where the centerpiece was a lime jello castle stuffed with shrimp, tomatoes, and peas, it would be.....er......memorable. Readers, have you had any 'memorable' meals? Do tell. 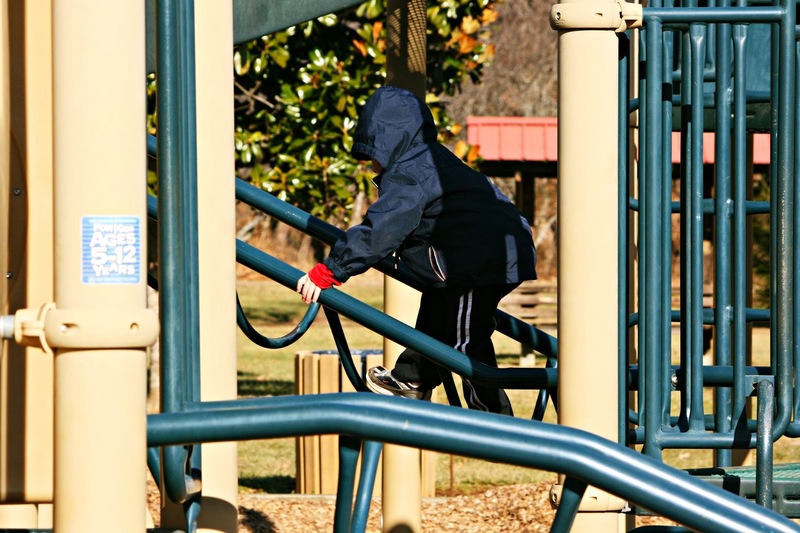 On a recent chilly day we headed for some fun at the park. It was in the low 40s, but windy, so it was pretty chilly when the sun wasn't out. 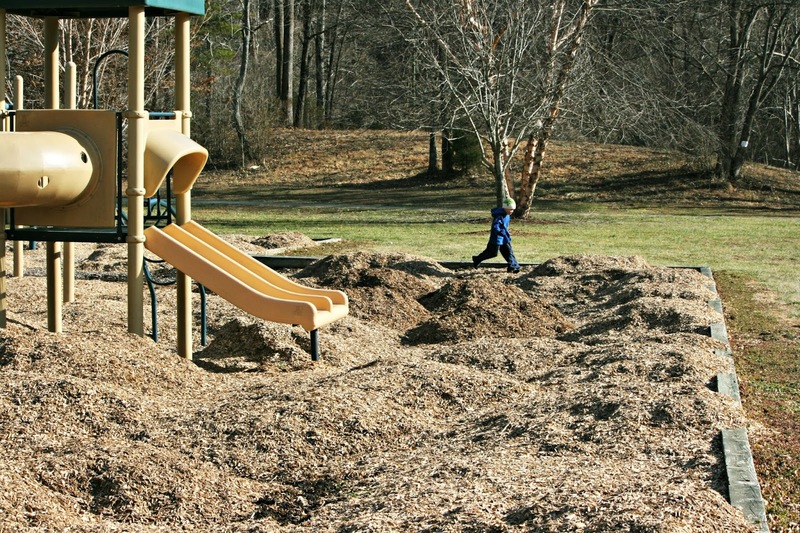 I guess the park wasn't expecting anyone to come visit, because we found huge mounds of mulch just waiting to be spread. 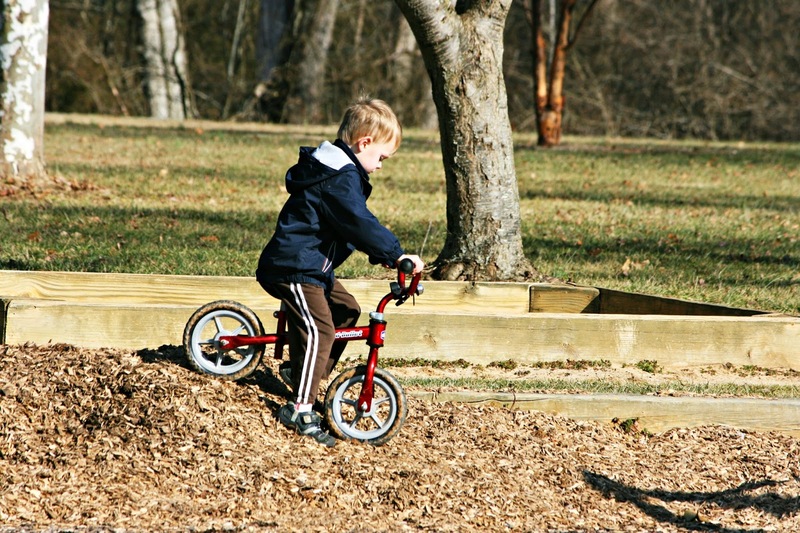 It turned out that playing on the mulch was just as fun as playing on the playground. But they still got in plenty of climbing time. As the wind picked up, we decided we'd had enough for the day. I asked the boys if it was too cold to stop for ice cream cones on the way home. They unanimously agreed it is never too cold for ice cream. Even if you don't have kids, you've probably seen the whole Rainbow Loom craze that is going around. I've seen numerous posts and instagram pics on the topic. I started thinking that Pierce might like to try his hand at the bracelet making process. When you think about it, it's not that far off from Lego building. It uses that same pattern-making thinking process. I didn't have much time the day I went to buy one, and the store I went to only had a knock-off brand. I bought it anyway, which was kind of a mistake because the instructions were awful. Fortunately, there are tons of videos online. Unfortunately, our internet connection is too slow to watch them. Fortunately, I had an Amazon gift card, and ordered the kid a book of patterns. Pierce took to the Rainbow Loom like nothing I've ever seen before. He made bracelets for his family. He made bracelets for his teachers. He made bracelets for his friends. 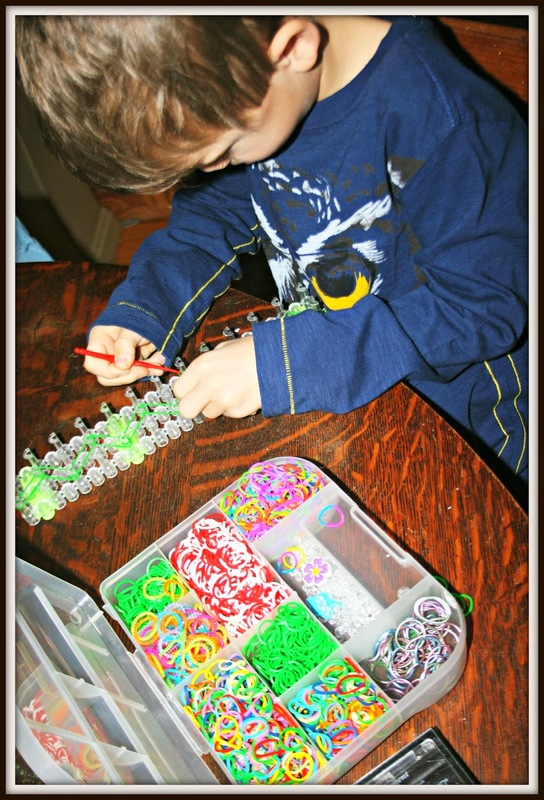 He said, "I LOVE MAKING BRACELETS!". And then he said, "you can now call me Bracelet Man". Okay, Bracelet Man, just remember to put away your laundry after you're done making bracelets, alright? Readers, did you love to make crafts as a kid? A few weeks ago a friend on Facebook posted that they were moving, and looking for a new home for their red footed tortoise. Well, you all know me by now. Never one to turn down an animal needing a home, I said we'd take her. She arrived with impeccable timing, on the same day our four year old betta fish, Josh, died. 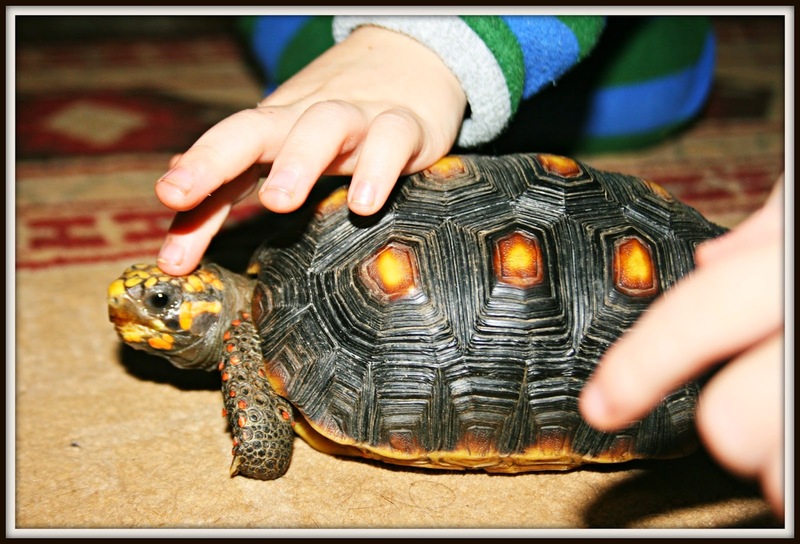 Boxley the tortoise was a welcome distraction. Cort and Reid immediately treated her like a member of the family. They "read" her several books, serenaded her with a harmonica concert (complete with dance moves) and played "bootiful" classical music for her with a toy Ipod. Boxley, for her part, doesn't seem to mind, and indeed seems kind of curious about the boys. So far, she seems easy to care for, eating fresh fruits and vegetables, and sleeping a good deal of the time. We are careful to wash our hands after handling, and have heard if you set up a safe spot for them using paver borders, they can enjoy living outdoors during the summer months. 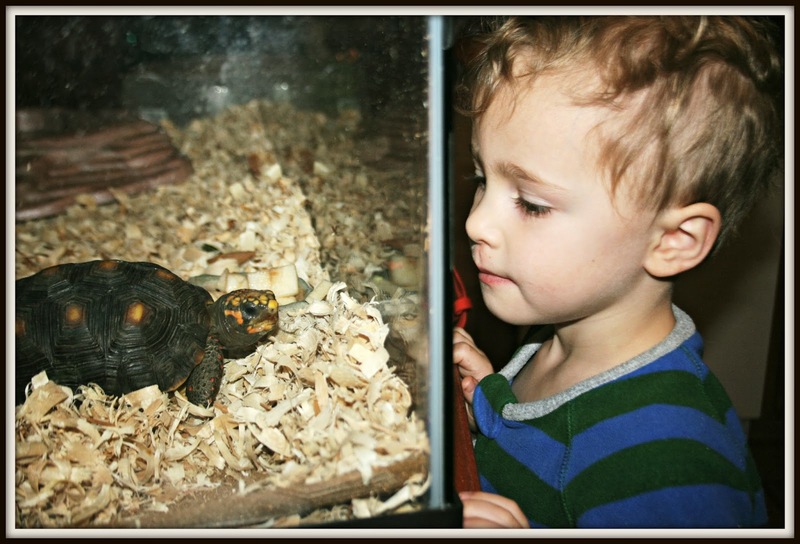 Readers, would you ever have a pet tortoise? 1. Look at the adoration. He's just waiting to hear his next command. His expression is one of absolute devotion. 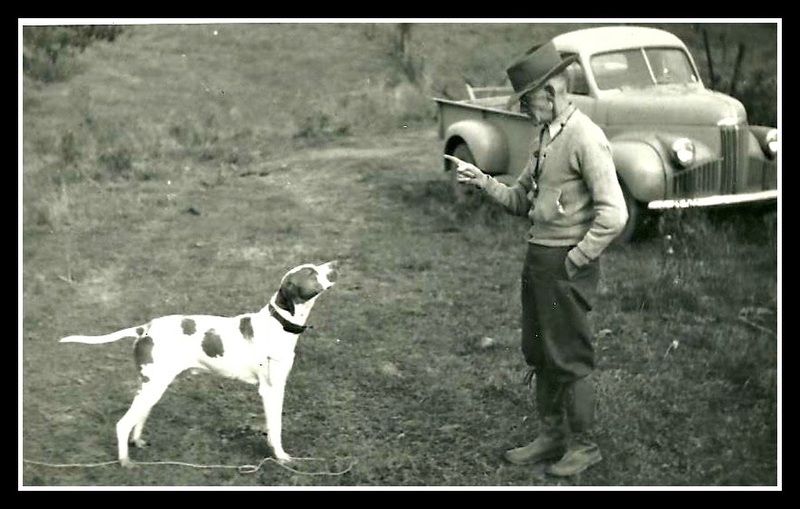 This picture is another interesting shot from the album at my grandmother's house, likely from the 1940s. I love the stern old man, with his directing finger, and the truck in the background. 2. Pierce was making a bracelet for his teacher, and said he would have to make it a little bigger because she is 94. I thought this was so funny. At some point, it seems she said something that made him think she is 94. I told him that if she says that again, he needs to tell her she can't be a day over 30. 3. We were driving through some thick mountainous fog recently, and I said, "wow, it's foggy!" Cort said, "Can you really cut it with a knife, like on Scooby Doo?" I was confused for a moment, and said, "Cut what?" Then I realized he really thought we could cut the fog with a knife. 4. Our wood stove is very drying, so we've taken to having lotion parties before bedtime, smoothing lotion over all the itchy spots. One night, Pierce reported that he was "putting lotion in his knee pit". Hey, it makes sense! 5. I miss having chickens. It's been much too long. I think an order of some chicks is going to be a must this March. Whenever the bus is more than 15 minutes late, I fret. Generally, I end up calling the school after 20 minutes, to see what is wrong. This has happened three times in the past 2.5 years. And each of these incidents are all confirmation for why I couldn't be a school bus driver. 1. The first time the bus was late and I called was because it had broken down. They had to wait for a new bus to arrive to switch all the kids over. If you know me well, you know I am neurotic about car troubles anyhow, and the idea of being in charge of the safety of all those kids while there was some mystery ailment with the bus would freak me out. What a HUGE responsibility keeping them all safe. 2. The second time the bus was late was because a girl completely lost it on the bus and they had to turn around and take her back to school. Pierce said that she was screaming at everyone, calling them names, hitting the seats and banging her head against the window. Can you imagine? Trying to handle that while safely getting all the other kids back to school? This child was seven years old. Talk about a bad day in school bus driving. 3. The third time I called because the bus was late I was told that a child became sick, and the bus had to take him back to the school. Now this seemed strange because normally if a child pukes on the bus (which happens with horrifying regularity according to Pierce) they clean it up and keep going. I wondered if the child had a seizure or something. 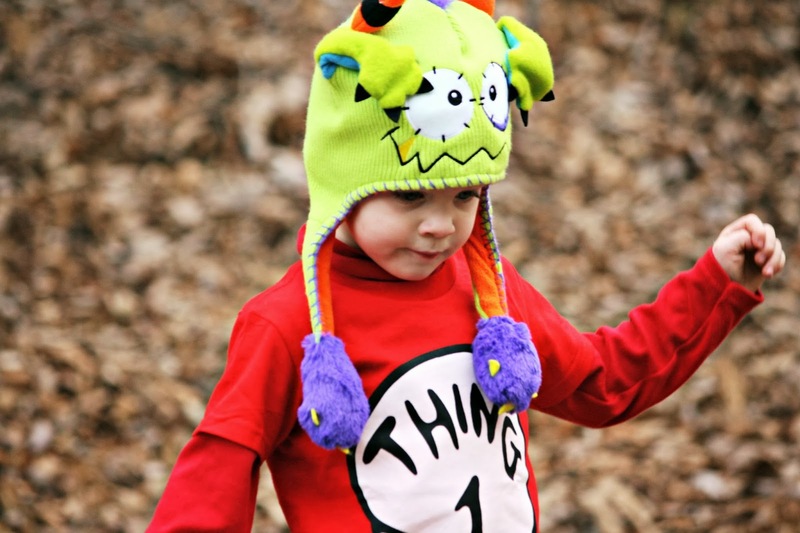 But Pierce reported when he came home (40 minutes late) that the puke was strewn all down the aisle, a mess of magnificent proportions, and that the kids were all shuddering in the back as puke tumbled down the aisles, looming towards them. Yes, my blogging friends, this would pretty much be my worst nightmare. 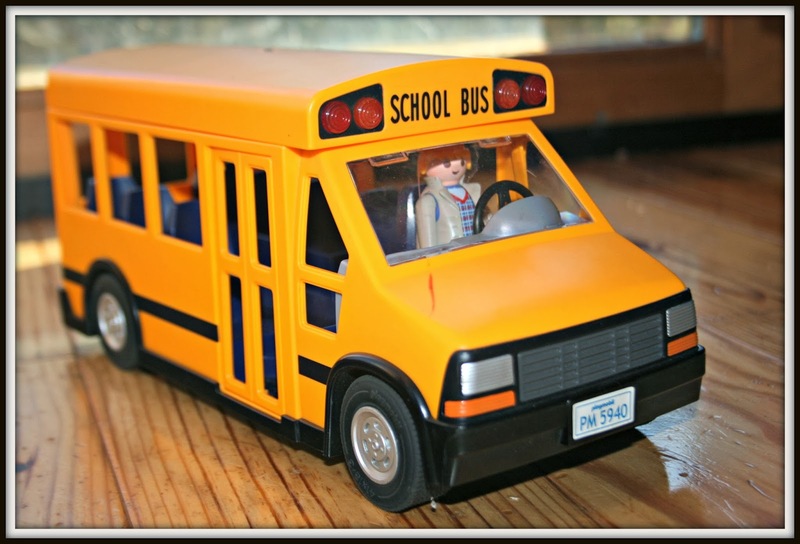 Readers, do you know a school bus driver in your life? If so, go buy them a cupcake. Or 10. And tell them thanks. Because I'm pretty sure they deserve it. After our entire garden got demolished by weeds last summer during our two week journey to Nebraska, I have been thinking long and hard about trying layering gardening. Ideally, I would've done all the work last October. But October is a busy month, and then before you know it the holidays roll around, and it just didn't happen. No matter. I am trying to pull it together now. Our garden plot is rather large, which makes the prepping a rather huge project. First, the boys and I got in and pulled any oversized or very tall weeds. Then, we took piles of mulch hay and did a layer over the entire garden. The mulch hay was disgusting. Slimy, blackened, moldy. It's good, though, that it was already partially decomposed, since I am starting this process a little late in the game. After the mulch hay comes a layer of 3-4 sheets of newspaper, followed by a layer of wood chips. We ran out of newspaper, so I only finished 1/8th of the garden. Still, it was a lot of progress for one day. Doesn't the corner I finished look good? You can see all the gross mulch hay around the edges, just waiting for the layers of newspaper and wood chips. 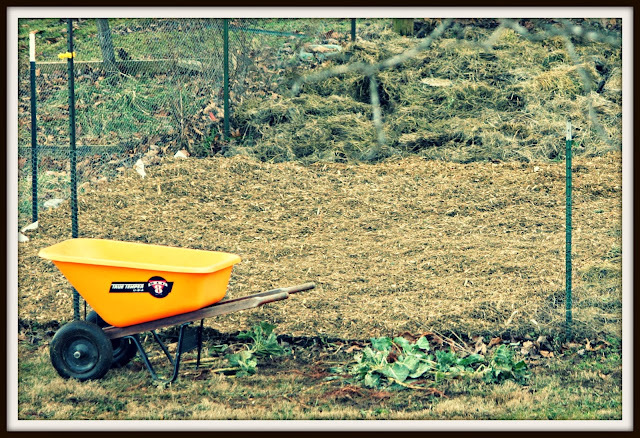 And by the wheelbarrow, last year's pulled brussel sprouts, which didn't quite ripen in time for harvest before winter. Once the newspaper and mulch is finished, then you put a layer of compost, and let it sit and stew until planting time. Hopefully it'll break down enough over the next couple of months to be ready come the end of March. Readers, are you making gardening plans yet? Have you heard of Blue Monday? It's the Monday of the last full week in January (today!) and some say it's the most depressing day of the year. Think about it. The holidays are over. Some have received large bills from the holidays. And winter still stretches a couple of months ahead. Not only that, but by now some folks have lost the motivation for their New Year's resolutions. 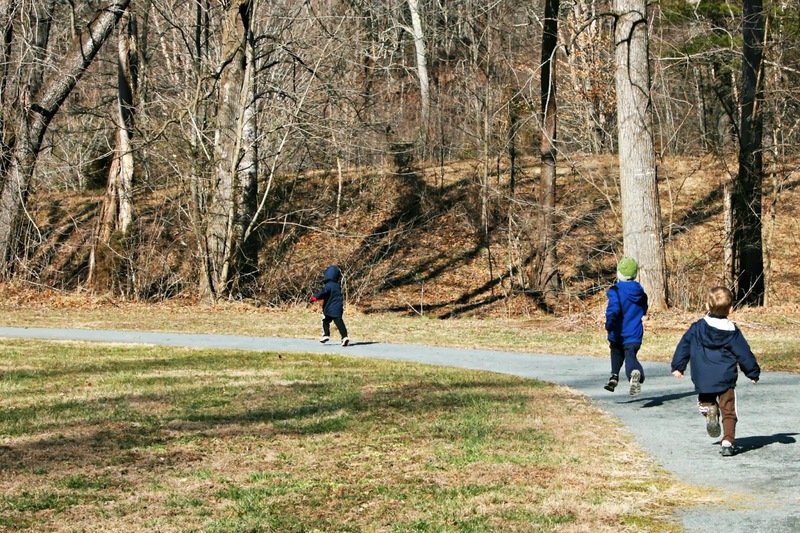 To combat the winter blues, you can grab a Clif bar and head outdoors for some natural endorphins. 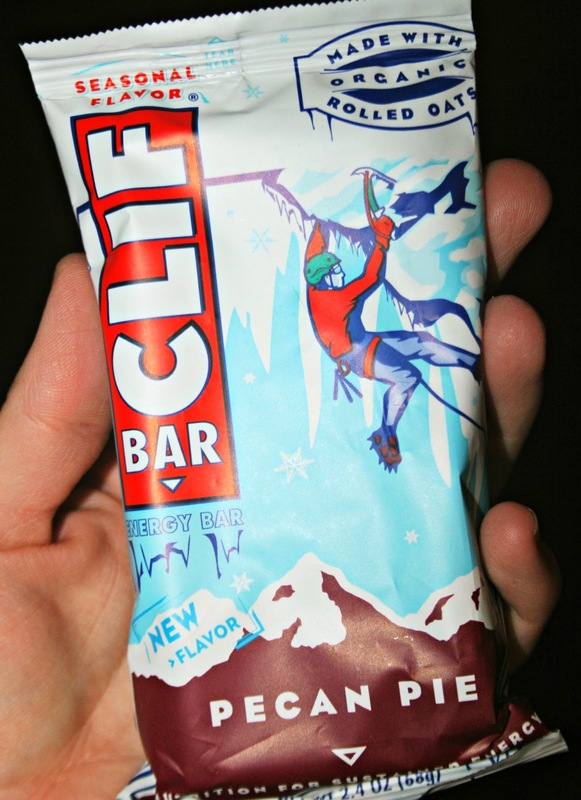 They're offering a pack of Clif bars to 5 lucky readers. I recently tried one of their seasonal flavors, Pecan Pie, when I was working late one night. It really helped me stay focused for the evening. They're made with organic ingredients, and have a wonderful flavor. Dislaimer: I did not receive anything in exchange for hosting this giveaway, but it felt it would be of interest to my readers. Stay warm readers! Blue Monday will be over before you know it. 1. Another photographic find from my grandmother's photos. 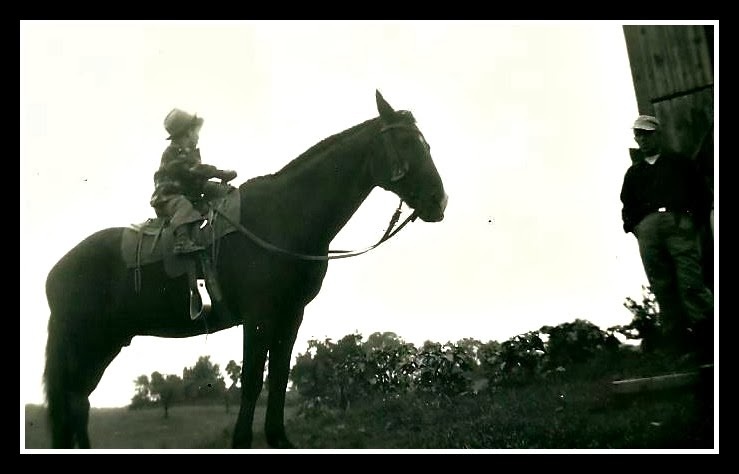 A tiny child perched on the back of this gentle-hearted horse. Surely he must've been a well-trusted animal for the parent to allow this boy on his back. 2. Are there Blogger issues in paradise? I've noticed recently some blogging friends have refollowed me. Which made me curious as to whether my blog was no longer showing up in the feeds. And then I wondered if some of the blogs I follow are no longer showing up in my feed. Anyone know what's going on? 3. A passing phrase that'll make a mom stop in her tracks: "I'm thinking of making a chemical reaction..." Wait. What? Pierce, get back here! 4. Someone asked if my treadmill has been fixed. Yes, happily, Paul was able to install the replacement parts, and I'm back in action. 5. I have been thinking about reorganizing my pantry for months now. It needs it desperately. One of these days, maybe I'll actually get it done. Just not today. After the holidays, I felt so worn out. I needed some relaxation. So the Friday after New Years, I set out to get all my chores and errands and running done for the next day. What I was doing was emptying out my Saturday, so I wouldn't have a bunch of pressing things I needed to do. The house was cleaned, the groceries were stocked, the laundry and dishes were done, and I finished my running mileage for the week. Saturday was a cold day. I snuggled up on the couch with a book. I read. Sometimes a cat or a kid joined me for a bit. Sometimes I did get up to make lunch or dinner, or brew some tea. Then I read some more. I went out for a bit, to work with Francie. Then back under the blankets with my book. It was pretty much the perfect day. I needed that. Readers, what do you do when you need relaxation? On many of the afternoons that I pick up Pierce from school after he has Odyssey of the Mind, I see a lady running the country road I drive. It's hilly, and curvy, with no extra room on the sides. Not the sort of road that invites running. But this lady....she's determined. Perhaps even more determined than I. Why? Well, she's German Baptist. Which means she runs in traditional handsewn, fitted dresses. 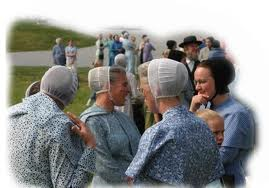 A stiff net cap covers her hair, and is tied under the chin. It seems like dreadful running gear. Winds would creep under the dress, which might flap and chafe the legs. Surely the tied cap under the chin can't be comfortable while trying to gasp for air. If it were to drizzle, the dress wouldn't shed any water (or sweat) and probably proves to be mighty weighty. Does she get sores, where it buttons snugly around the neck? 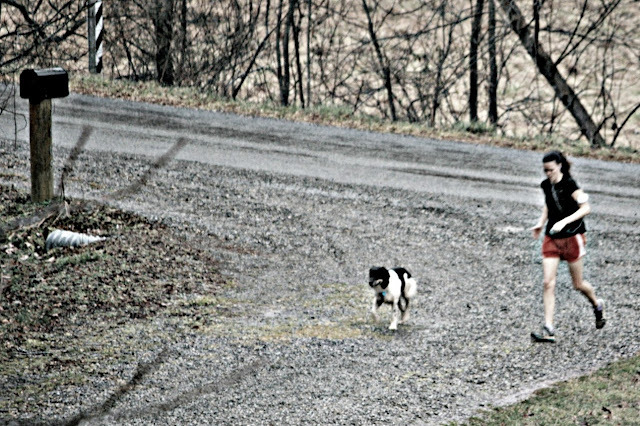 Each time I see her, her focus and determination to run on this curvy hilly road in such a get-up fills me with admiration. And I feel thankful for every stitch of running gear I own. 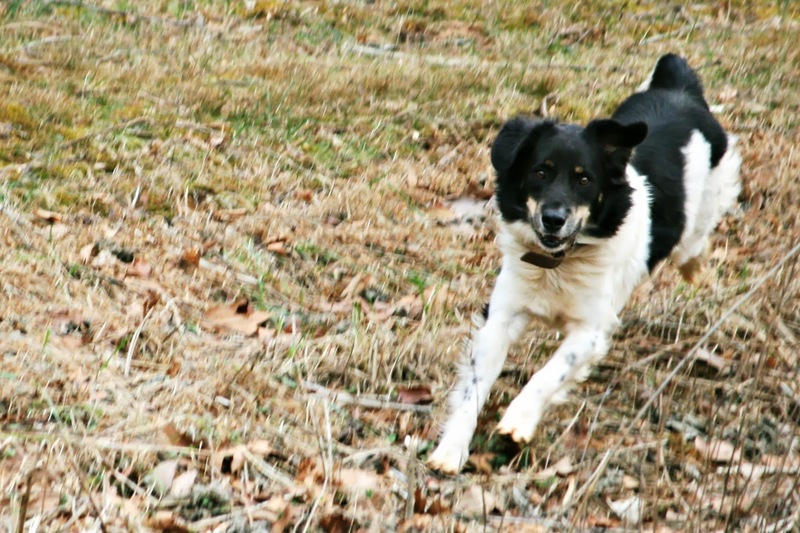 Francie likes to watch me running. 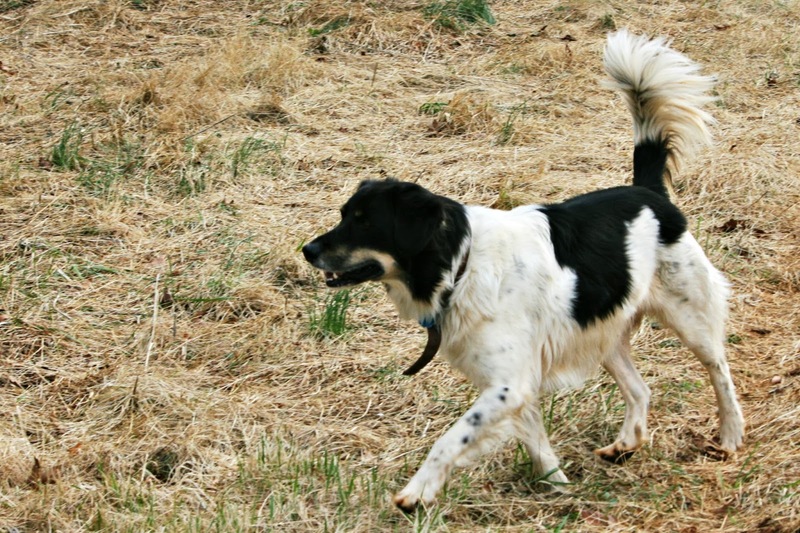 When I run alongside her pasture, she often trots beside me. I don't generally like most kitchen gadgets. They tend to take up a lot of space in my small kitchen, and often are more work than they are worth (except for my Kitchenaid and breadmaker). Recently I was in Dollar Tree, and saw these things called Eggies that allow you to make boiled eggs without the shells. I thought it was a brilliant idea, because who doesn't hate peeling the shells off eggs? For a dollar, I figured it was worth a shot. I brought it home and pulled out the instructions, plus what seemed like a billion plastic pieces. Each eggie has four different pieces. Each piece had to be washed. Then I had to grease them all. I used nonstick cooking spray, but you can't just spray it on for some reason. You have to spray it on a paper towel, and then wipe each piece down. Then you have to partially assemble the pieces, and crack each egg into a bowl, then pouring it into the eggie. Next you have to screw the eggie together. Oh yes, all this just to get started. 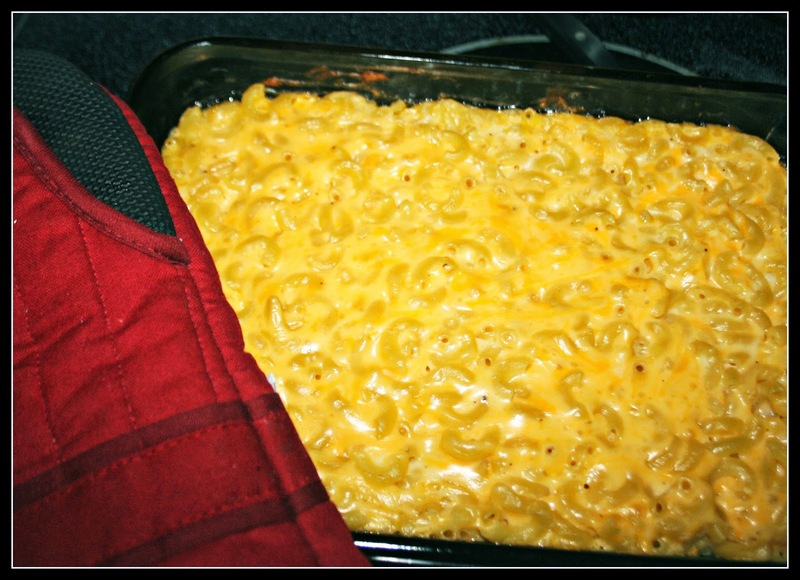 Eventually I got all this done and my eggies were boiling away, when I noticed the water getting rather foamy. Somehow, I didn't get one of the lids screwed on all the way, and foamy egg was spreading all over my pot. Big time mess going on. By the time they were done cooking, there was egg all over the place. I dumped water out of the offending eggie, and let them cool. I stared in dismay at all the messy, egg-covered pieces, which while dishwasher safe, were definitely going to need some scrubbing. Despite it showing perfectly shaped eggs on the eggie box, you don't get perfectly shaped eggs. You get eggs without a top. They are kind of goofy looking - not the sort of thing you'd want to take to a potluck, as people would eye these alien-shaped eggs with disdain and be afraid to eat them. Overall, I'd say the eggie experiment was a big fail. Except my boys did eat the eggs, and loved them. However, my box of eggies has gone on to Goodwill to hopefully find a more appreciative home. As for me, my future deviled eggs will be crafted the good old-fashioned way. Which....as it turns out...is truly much easier. Readers, have you found any instances where old-fashioned is better lately? I bought a big bag of horse treats for Francie. I thought she deserved a little spoiling, after all she'd been through. Francie sniffed them. And said no thanks. I offered her carrots. Is there a horse that won't eat carrots? Yes. Francie won't eat carrots. I guess she hasn't really had anyone offer her treats before. I guess she never had someone who loved her enough to want to pamper her. Poor Francie. At least she likes the Equine Senior sweet feed I've been giving her. No, she's not a senior. But my childhood friend who knows all about equine nutrition said it was the best I could give her to help her build weight carefully, and my vet agreed. As for the treats, well, I'll keep trying. There's bound to be something she would like! I have an exciting update on the horses down the road. Thanks to the donations from readers, I was able to have the vet out last week. I stressed about having that stud colt gelded, because I was afraid we wouldn't be able to catch him since he hasn't been handled, and there is a huge pond in the mud pit where they reside and I was terrified he'd fall in it while awakening from sedation (sometimes horses will panic). Even my vet was worried about this, wishing the colt wasn't so wild so that we could do the gelding at our place, which has cleaner, more open space for a surgery. But things went smoothly, and he is no longer a stud! Even the weather cooperated, not being as cold or rainy as it had been. In addition, I had enough donations left over to do rabies vaccines for him and the older horse, as well as a Coggins test. The vet said that they are looking much "less ribby" since the massive deworming (which was also thanks to your donations, readers). So know that together, we have made a huge difference for these animals! Being able to help these horses has been one of my happiest moments, thank you readers for your support. I've blogged before about how much we love watching old episodes of Little House on the Prairie. For Christmas this year, Santa brought the boys Season 3. Now we have the first three seasons. The only problem is, we can't get past first episode on the second disk. It's the only one my boys want to watch now. Perhaps you remember too. I had forgotten about the episode titled The Monster of Walnut Grove. Until I started watching it. Then I remembered what an impression it made on me as a kid. 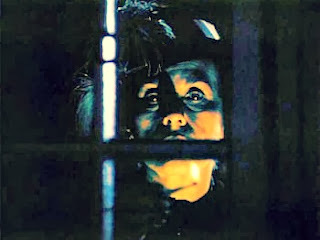 In it, Laura sees Nels cut off Mrs. Oleson's head with a sword. 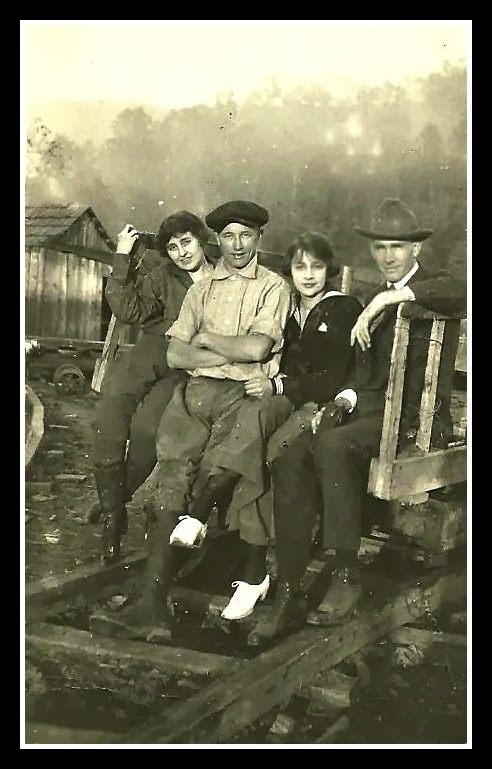 Laura is terrified and tells a few folks, and Nellie and Willie realize she is mistaken (what she actually saw was Nels cutting the head off a mannequin), and take advantage of the situation by terrorizing Laura, in typical Nellie/Willie style. Never fear, though. Laura gets her revenge in the end. The first time we watched, the twins were so scared they had to come sit on my lap and snuggle. But then once they knew that none of it was real, they were delighted. Now they want to watch nothing else. But the snuggling is still required. After all, it's still one creepy episode. It's a tough job, being a farm dog. There's always something that needs a little chasing. Daily trips down to the stream for a dip in the mud are a must. Even if that means you aren't allowed inside for a few hours. 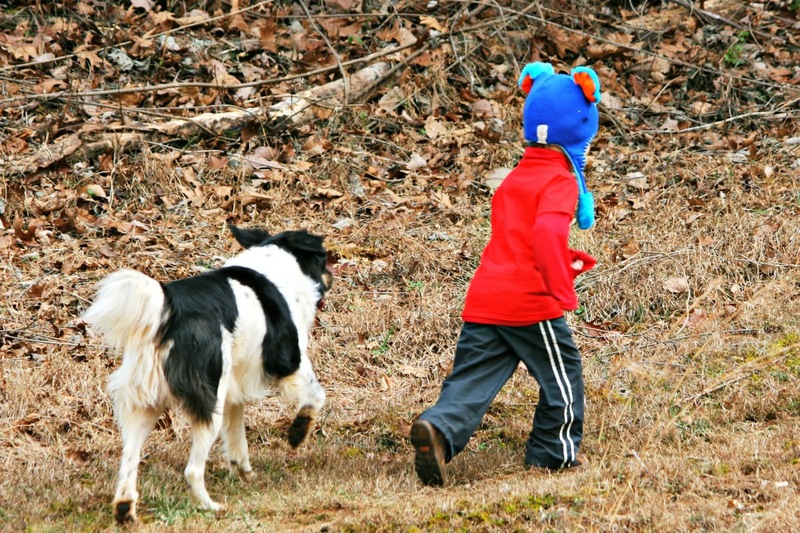 And even if there aren't any sheep on this farm for herding, there are plenty of boys that need a little guidance. Yup, it's a tough job, but somebody's got to do it. Speaking of awesome dogs, maybe some of you follow Tweedles? 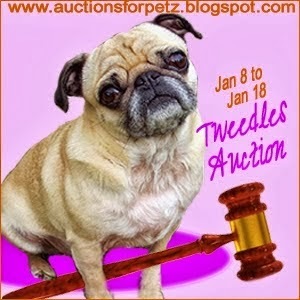 She is a little puggy who had major surgeries recently, and there is an auction going on to help raise money for medical bills. I have donated a couple of my homemade soaps for the auction, and there should be many other neat items featured. Please check it out, if you have a moment. A milder than usual winter's day (week before last, it's much to cold for this right now!) led to a walk in the woods. 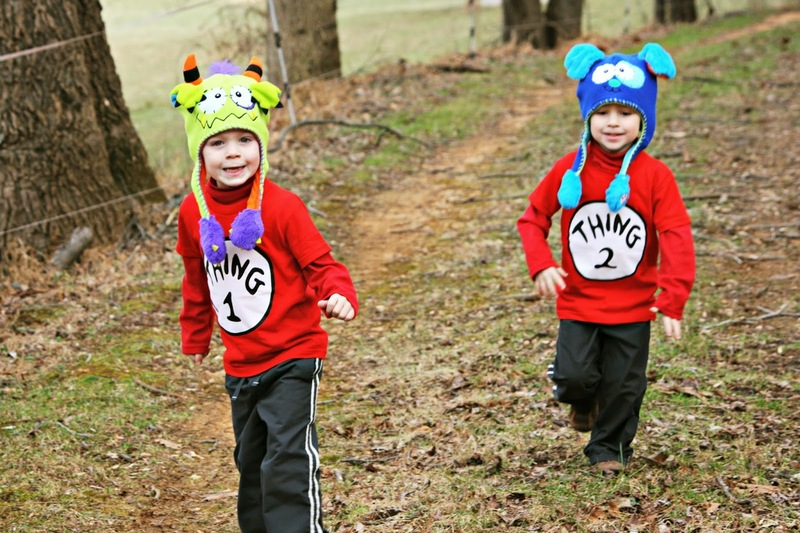 There, I found Thing 1 and Thing 2. Thing 1 and Thing 2 found a fallen log. 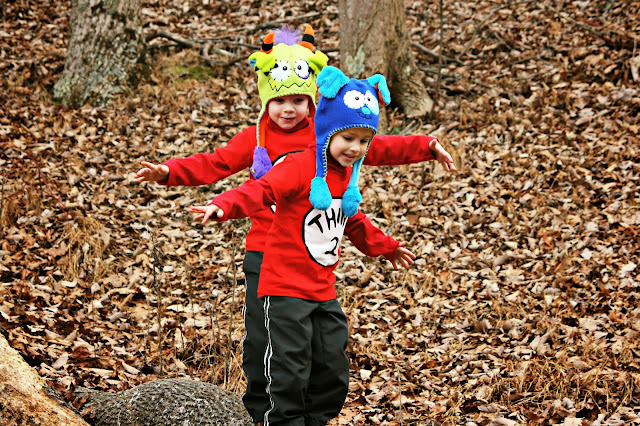 Yes, we were thankful for a milder day or two. 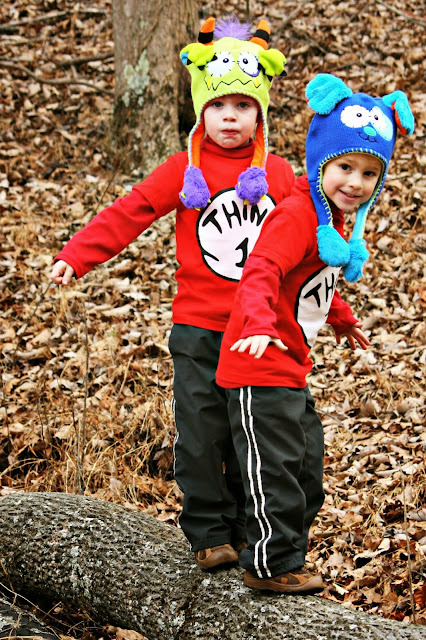 Readers, are you doing any balancing acts lately? 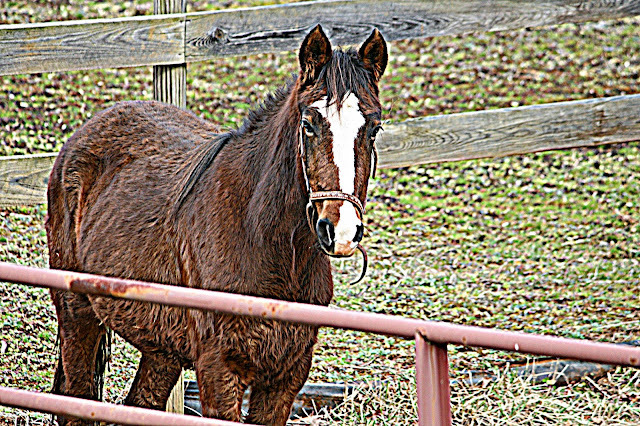 Many of you know that my 21 year old horse, Phoenix, was a horse I rescued from abuse at the age of three. He was quite a project, being so scared of humans at that point that his entire body shook when I tried to pet him. 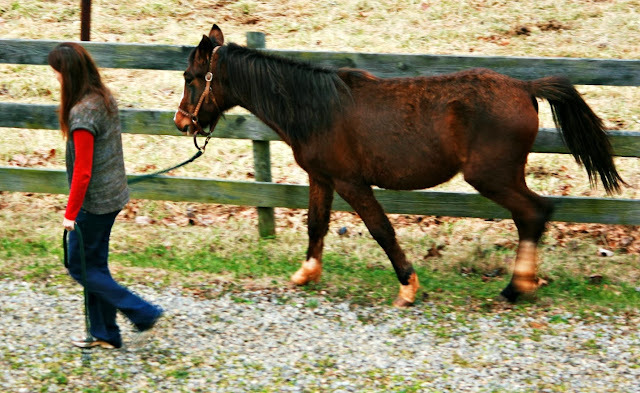 I remember when I was trying to teach him to work on the lunge line (a long rope that hooks to a halter or bridle, and the horse moves in circles around you, learning commands this way and getting out energy) he was a little crazy. I took to wearing gloves, because he'd start bucking and running, and would drag me around the pasture and several times blistered my hands, or yanked the lunge line from my hands and took off running. He fought me for months over having his hooves cleaned. And he broke more halters than I can count by setting back when learning to be tied. In comparison, Francie has been easy (so far). She only fought me for a couple of days over having her hooves cleaned. Now she's happy to comply. She thought about setting back once or twice while tied, but always cleared her mind and then moved forward as I spoke to her reassuringly, before breaking any halters. She learned to cross tie quickly - and while nervous the first couple of times, she now stands nicely in the cross ties, allowing me to groom her. I also started her on the lunge line. Just doing short little lessons - ten minutes or so. At first, she was confused. She didn't want to move away from me. She wanted to be with me. So she kept trying to turn in and come to me. But she's picking it up now, and she doesn't buck or take off running the way Phoenix did. Her circles are choppy, and sometimes she gets confused and tries to switch directions, but she really seems to have a good head on her shoulders and she definitely wants to please me. You can see how stunted her growth is in this picture. The vet doesn't think she will grow much more. Fortunately, she seems to make up with personality what she lacks in size. I really enjoy bonding with her. I know you might look at this picture and think she looks a little rough - but seriously - she looks fantastic compared to how she looked when I brought her home over Thanksgiving. The change is remarkable. 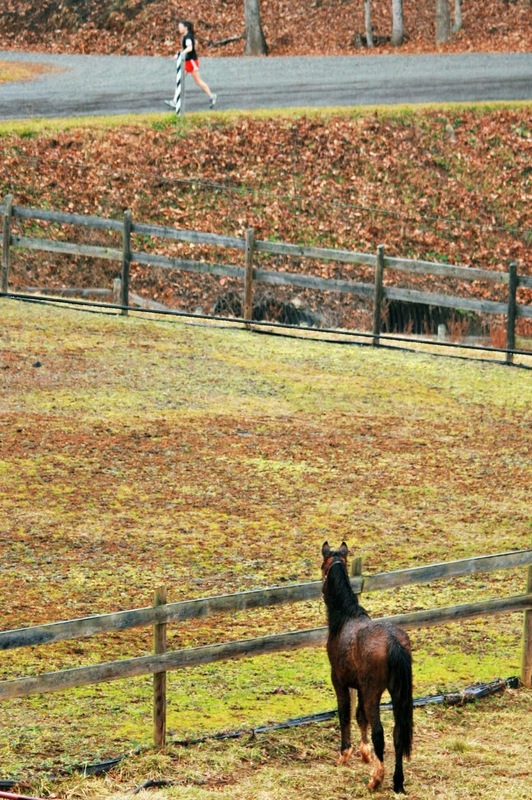 As for the horses down the road, their owners have agreed to allow me to arrange for the gelding of the stud colt. This is excellent! I will also be having some vaccines done at the time the vet comes out, thanks to the donations from generous blog readers. What a great way to start 2014 for these needy horses! 1. When we visited my grandmother before Christmas, she let me have some old black and white photos. There were so many neat ones. She didn't know the name of the little girl in this picture, but I found it fascinating. I believe it must be from the 40s, like many of the other pictures that had dates on the back. 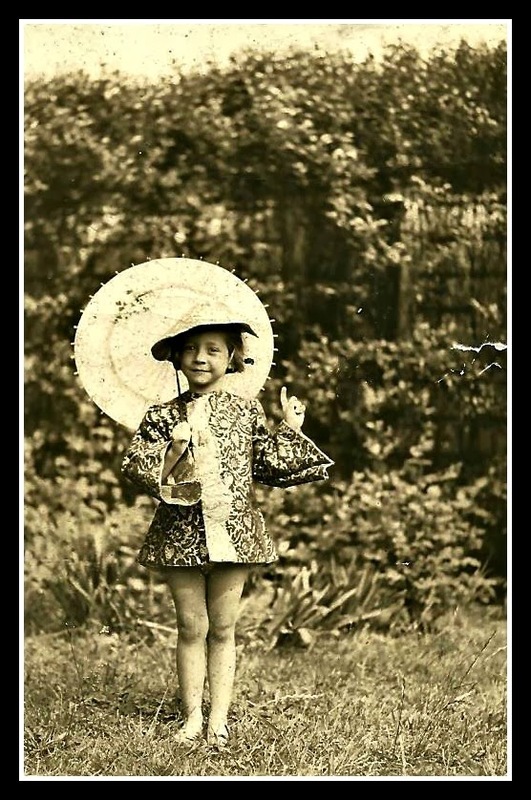 I suppose someone that was in the war may have sent her the outfit. 2. We had a very nice Christmas. Except for when Reid broke out in a mystery rash all over his body, which progressed to puffy welts and even some pustules. He got several doses of Benadryl over the course of the day as we watched closely. Luckily, mystery rash receded over the night. Cort's allergist took a look for me at Cort's routine appointment, and said he had postviral hives. 3. The other day when we were driving to town that song "we will, we will rock you" was on the radio, and Cort said in a funny voice, "Mom, why does he have mud on his face?" I had to laugh. How do you explain that line to a four year old? It must seem so strange to them. 4. I like to take down all the Christmas decorations the day after Christmas, find places for all the new toys, and clean up the house. This year, we were too busy that morning, and it irked me that it was all still up. 5. We've now entered the time of year when I start longing for Spring every single day. The next two months are usually long for me. I'm not the biggest fan of winter. Please know that I am not necessarily recommending these books - while I did like most of them, some I did not. 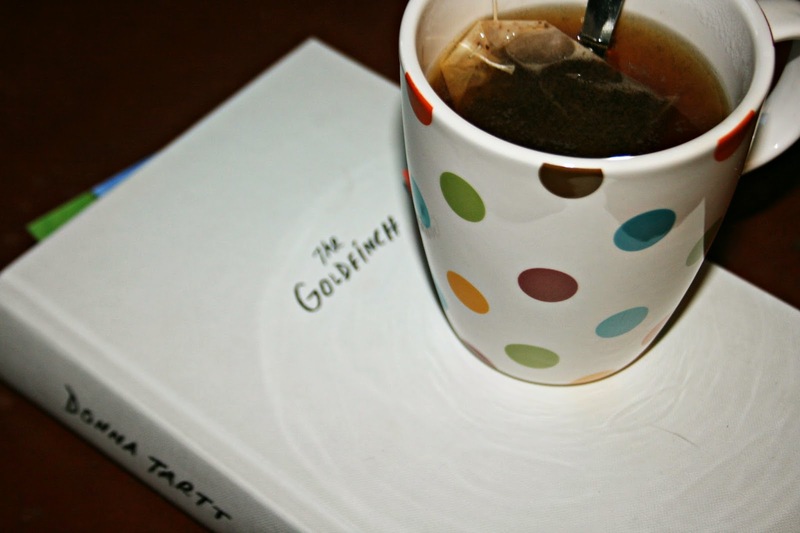 How about you, readers - read any good books in 2013? This year marked my 10th year of consistent running, and the first year since I started that I didn't run a single race. A couple of good things came out of this year, the first of which is that I ran all year without being injured. Sure, there were a couple of times when one part or another was twingeing, but nothing developed from it. The other thing I realized is that I don't need racing to hold my motivation. When I taught psychology classes, one of the concepts I covered was intrinsic vs. extrinsic motivation. People who are intrinsically motivated find their motivation deep inside themselves. People who are extrinsically motivated find it from outside sources - in the case of running, this could be races, people commenting on Facebook statuses about their workouts, prize money, etc. In examining my year-end mileage, I see that this year was one of my highest mileage running years (the highest was in 2007, the year after Pierce was born, when I ran 3 marathons). I ran 1240 miles, with not a single race or running partner for motivation. I run because my soul wants to, because it feels freeing and keeps me happy, and I don't need anything more than that. I was surprised to realize this. Here I thought that I needed racing. That if I didn't race, my running would fall apart. That hasn't happened. I'm certainly slower because of not racing, but you know what? I'm healthy, and injury-free. And that's a good thing. That said, I'm going to try to race again in 2014. Not a lot. Maybe just one or two. I do have a race in mind. I'll see how it goes. It's low-pressure race, which I'll do for fun, if I feel like I can run it without injury. Mostly, I'm just looking forward to many more zen miles this year. How about you readers? Are you still discovering things about yourself that are surprising? I hope 2014 is a great year for all of you!